I took my Canadian friend Romeo in the beach of Pagudpud where we met up with Peachy who spent a night ahead there. We stayed at Polaris resort. I saw fishermen who caught this sea crab. 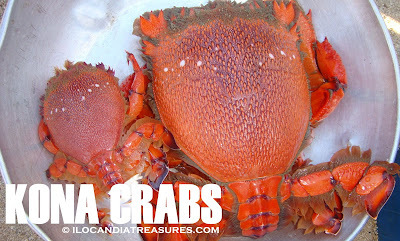 These crabs are caught using a flat, circular nets placed along the sea floor and baited with fish. There were lady vendors who sell this around. It sells like hotcakes because this comes only on a limited catch. It is called kusimay in the Ilocano vernacular. Curacha is the local Chavacano name and you find much of this in Zamboanga. It is also found in Australia and Hawaii. This is a highbred crustacean, mixed breed of a large sea crab and a spiny lobster and resembles like a cockroach. It is called Kona crab in English. This has a reddish-pink color shell. This is being sold at Php300 per kilogram. Peachy bought a few kilograms and shared some of it to us and we enjoyed our dinner with it. This can be steamed or cooked with garlic and butter. This is usually cooked slightly to preserve its original taste. It was really a yummy treat.